JU has welcomed some of the most renowned figures worldwide in civic life, business and the arts to speak at recent commencements and events, and is honored to have as its featured speaker one of its own Distinguished Dolphins who has been named a “Legislative Champion” and “Senator of the Year” by many organizations, said President Tim Cost. The University has a proud tradition over its 83-year history of bringing important individuals to speak on campus, including President Lyndon Johnson, President Gerald Ford, anthropologist Margaret Mead, Chemistry Nobel Prize Winner Linus Pauling, Federal Reserve Chairman Ben Bernanke, Massachusetts Governor and 2012 Republican Presidential nominee Mitt Romney, Pepsico CEO Indra Nooyi, documentary filmmaker Ken Burns, and many more in the fields of business, science, the arts and civic and cultural life. Those planning to attend the ceremony should arrive early for a good seat. Facebook Live streaming video of the event will be at the University’s main page at https://www.facebook.com/jacksonvilleuniversity. 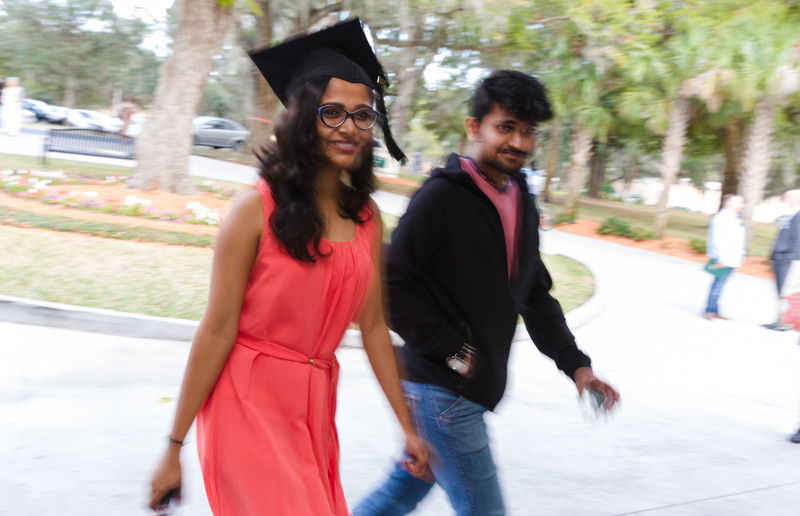 Look for live updates on Twitter at @JacksonvilleU, and use the hashtag #JUgrad for social media posts. Graduates will assemble in Historic Swisher Gymnasium at 8:30 a.m., line up at 9 a.m. and process to the iconic Dolphin Sculptures behind the Howard Administration Building, where they will meet the Platform party just before the ceremony’s 9:30 a.m. start. The groups will all then be led in to the ceremony by a traditional bagpiper. During the celebration, the Fred B. Noble Gold Medal for Scholarship, first awarded in 1957, will be given to the undergraduates who have earned the highest GPA in their class. The seniors’ contribution to the annual Class Gift will be announced, and Capt. Neil Karnes, JU NROTC Commanding Officer, will present officer candidates for commissioning. A Faculty Corner immediately following the celebration will be held in the shaded area behind the Commencement Platform, where students can meet up for photos with their favorite professors. A Nursing Pinning Ceremony is set for 2 p.m. Friday, April 28, in Terry Concert Hall, where graduates of the Keigwin School of Nursing in the Brooks Rehabilitation College of Healthcare Sciences will receive their pins. The Senior Stroll is set for 4 p.m. Friday, April 28, at Dolphin Plaza behind the Howard Building. 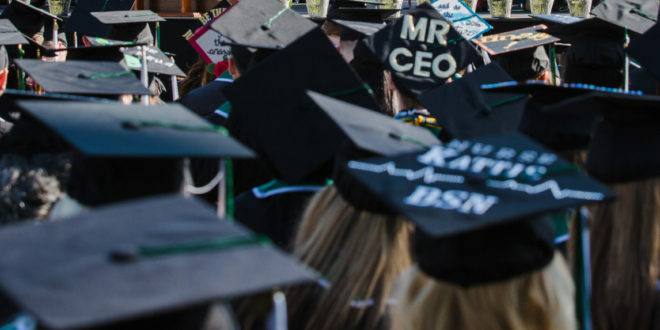 All graduates are warmly welcomed for a group photo, champagne toast and festive march with live band through campus to the Graduate Reception at 4:30 p.m. at the River House – sponsored by the JU Alumni Association. Light hors d’ oeuvres and refreshments will be served, with faculty and administration in attendance. Attire is business casual. Caps and cords are encouraged. Graduates should remember to check in with the JU Alumni Association to pick up their free commemorative champagne flute. For more information on Spring 2017 Commencement, visit http://www.ju.edu/commencement. 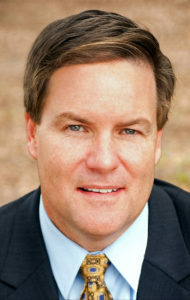 Sen. Aaron Bean was first elected to the Florida Senate in 2012. He was subsequently re-elected without opposition in 2014 and 2016 and is currently serving as chair of the Appropriations Subcommittee on Criminal and Civil Justice. Before being elected to the Florida Senate, Aaron served eight years in the Florida House of Representatives, including a term as chairman of the Duval County Legislative Delegation in 2008. Aaron was tapped by then-Speaker of the House Marco Rubio to chair the House Health Care Committee, which oversaw all health care policy and the appropriations for approximately one-third of the state budget. Prior to being elected to the Florida House in 2000, Aaron served as a commissioner and mayor of the City of Fernandina Beach and was named “Best of the Best” by the Fernandina Beach News-Leader. In 2017, Aaron was named “Legislator of the Year” by the Florida Osteopathic Medical Association for his support and commitment to osteopathic medicine and the delivery of quality health care to the citizens of Florida. He was also named “2016 Legislator of the Year” by the Florida Academy of Nutrition and Dietetics, “Legislative Champion” by the Boys & Girls Club and a “Distinguished Advocate” by the Florida Chamber of Commerce. In addition to serving as president of Compass Bank in Nassau County for 11 years, Aaron has successfully launched four small businesses, including the High Energy Auction Company. He has been a professional Florida auctioneer for more than 17 years, and his quick wit and impressive results have put him in high demand as an auctioneer throughout the State of Florida. Aaron received his Bachelor of Science in Finance from Jacksonville University in 1989 and is currently the relations development officer at UF Health Jacksonville. He has been a Rotarian for 26 years and a volunteer for numerous organizations, including the National Alliance for Mental Illness, the YMCA, Crime Stoppers and Nassau County Schools. Aaron and his wife, Abby, reside in Fernandina Beach, Florida, and have three sons: Bradley, Gray, and Walker.